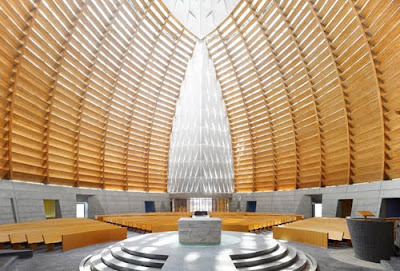 Today my parents and I stopped into The Cathedral of Christ the Light located about half-a-mile from my house. 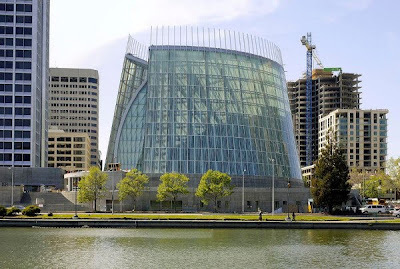 This cathedral was under construction when I moved to Oakland over two years ago and it opened a little over a year ago. I went inside soon after it opened and thought it would be a good place for music, but was disappointed by the lack of music on the calendar. Well, today, I found the schedule and I'm so excited about a venue like this being so close to my house! For those of you that know me, you know that I'm a nice Jewish girl that LOVES music about Jesus. No apologies here! For those of you that are new to this blog, get used to it (I wrote my Master's report on the commercialization of gospel music). Check out my examiner.com article and see what amazing concerts the Bay Area has in store: Bach, Rachmaninoff (The Vespers! Hear a selection down below) and choirs like Chanticleer and the Oakland Symphony Chorus as well as groups that I didn't know about like the Pacific Boys Choir and the California State University East Bay Singers.